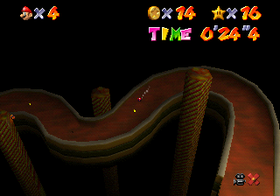 The Princess's Secret Slide is one of the secret levels in Super Mario 64 and Super Mario 64 DS, as well as being one of the three slides in the games. The entrance to the course is in Princess Peach's room of her castle, behind the door marked with a "1" on the mezzanine. Inside the room are three stained-glass windows with images of Princess Peach on them. Jumping into the one on the right will lead to the slide. In the DS version of the game, the room is expanded to include the locked doors with the other characters behind them, and the number of stained-glass windows was reduced from three to two, but the stained glass window on the right will still lead to the slide. Additionally, if the player falls off the slide, they will be brought back to the lobby of the castle, with no life lost. Also in the DS version, it is one of the four courses in VS Mode. The first Power Star is at the start, the second is in the middle of the slide, and the last three Power Stars are in the ending room. This is the only secret course that contains Blue Coins and the only course that has no Red Coins in the original game. The player starts in a room with a Blue Switch to the right. Once the player enters the slide ahead, a timer will begin. The slide will first take the player down a large tunnel, which leads to a steep downward slope. After a large 270° bend are a series of drops with a 1-Up Mushroom in this area followed by several bends, ultimately leading to the end room of the slide. This secret stage has two Power Stars to collect, and it is the only stage in the original game to contain two of the castle's Secret Stars. The player must ride the slide all the way to the bottom and hit the ! Block to collect the Power Star. This second Star will only appear if the player reaches the bottom of the slide in under 21 seconds. This Star will appear in front of the ! Block that contained the first Star. The music that plays in the course is a variation of Bob-omb Battlefield's theme (also the main theme of the game), as well as Cool, Cool Mountain's music, involving a Western style, with an instrumentation of a fiddle, a bass, drums, a piano, a banjo, and whistling. This music can also be heard during the races with Koopa the Quick, and in most other secret courses, in secret areas that involve a slide, and in other regular courses such as Tick Tock Clock and Rainbow Ride. This music has since been arranged in multiple future titles in the Mario franchise, including the Super Smash Bros. series; Super Mario Galaxy 2 in the Tall Trunk Galaxy mission "Tall Trunk's Big Slide" and in the Rolling Coaster Galaxy; Paper Mario: Sticker Star during the mine cart sections in Bowser's Snow Fort; Super Mario 3D World while riding Plessie, which was reused in Captain Toad: Treasure Tracker during part of the Coins Galore minigames; and Mario & Sonic at the Sochi 2014 Olympic Winter Games and Mario & Sonic at the Rio 2016 Olympic Games as one of the tracks that can be played in events, which is Toad's theme in the latter game. The original song is also featured in Super Smash Bros. for Wii U and Super Smash Bros. Ultimate. After Mario gets the first Star from the level Bob-omb Battlefield, the message erroneously says that the entrance to this secret level is on the second floor, while in fact it is in a higher section on the first floor. This page was last edited on April 18, 2019, at 21:26.